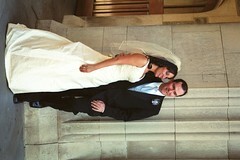 You can start to check out some snapshots from my wedding that are starting to come in from our friends and family. The professional ones won’t be up for (I’m guessing) at least another week. Go here to see them.